You have a chance to make a donation to Ronald McDonald House Charities of Alabama (RMHCA) go even further on #GivingTuesday November 28, 2017. Starting at 7 a.m. CST on November 28 only, the Bill and Melinda Gates Foundation will match donations to U.S. nonprofits up to $2 million. 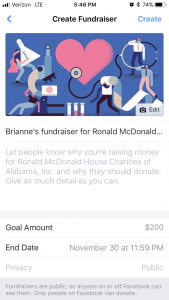 So a $50 donation could turn into $100 for RMHCA! If you would like to take advantage of this opportunity to support the House, make sure to set up a Facebook Fundraiser on your personal Facebook on Tuesday, November 28 and then ask your friends to donate. 1. From your profile page, tap on the three bars in the bottom right corner. 2. A new menu will open up. 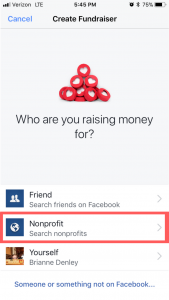 Scroll down until you find “Fundraisers” and tap that option. 3. 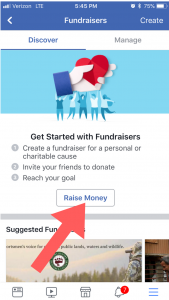 Facebook will ask you to start raising money! Tap that button. 5. 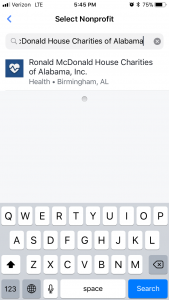 Enter our Ronald McDonald House Charities of Alabama in the search bar. Tap our name to select us as your fundraiser’s recipient! 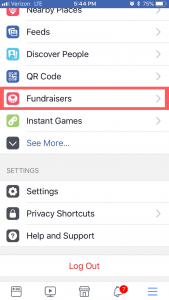 Note: There are many RMHC chapters available to select in Facebook Fundraisers. Make sure you put our whole name! 6. The final fundraiser page will open up. Set your goal amount, end date and tell your friends why you’re raising money for us. 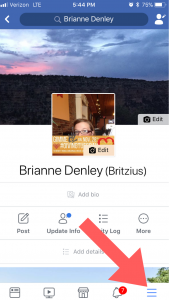 Then hit create and share it to your profile!